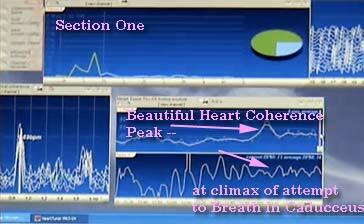 ANOTHER Neurofeedback Breakthru: NEW- 'GFFT' Cepstrum Measuring COHERENCE at ANY Brainwave Ratio! -Displays the RATIO between Contained Frequencies, AND The AMOUNT of (internal phase) COHERENCE at that Ratio. + (related) - IS Perception exactly the wave mechanics of PHASE CONJUGATION. is a (or THE?) Primary Wave Mechanism of Perception.. Origin Alphabets Physics - Stellar Purpose/History of DNA Newest Compleat 400 Image Implosion Powerpoint! Leads the WORLD! In both Definition and Measurement of Peak Perception / Meditation / Bliss.. Describes for the first time - a World First - THE REAL PHYSICS OF PERCEPTION! Perceval - Perceive-All, Pierce Evil: perceive the grail - - the phase conjugation that IS perception! Observe something you arrogant physicists: Fractality Causes Charge to ACCELERATE! 'A Hundred years writing equations, these physicists are NO closer to knowing what electric field symmetry will feed DNA or a seed! They are fools! "- Dan Winter- is arguably the worlds foremost expert on the physics of meditation, the physics of kundalini, and the electrical nature of consciousness. Using the pure charge symmetry language of physics, he argues that that western scientists are fools and leading the race to death because- they do not have the barest clue to the electrical nature of life, the function and purpose of life - even the immortalizing coherence making electrical function of DNA. Current scientists in their fabulously arrogant ignorance ("Why does an object fall to the ground, Mr Einstein?") have not the least clue to how gravity is made and stabilized (fractality) and therefore how DNA creates an implosive and gravity making (phase conjugate) coherence field that CAN get immortal. In effect - western science is literally blind to everything that makes life meaningful- namely - that which brings charge (fractally) into DNA to the point of the BLISS (see how it's measured) - that makes you sustainable (how surviving death is measured in charge coherence). Why should spiritual growth be precisely the science of electric fields? Because anything else would not be a unified field. . - Follow us as we explore how the simple physics of fractal charge deeply explains - to the point of true self empowerment - the deepest mysteries of LIFE! - backgroup reading here: The Constructive Aspect of Visual Perception: A Gestalt Field Theory Principle of Visual Reification Suggests a Phase Conjugate Mirror Principle of Perceptual Computation Steven Lehar - Abstract Many Gestalt illusions reveal a constructive, or generative aspect of perceptual processing where the experience contains more explicit spatial information than the visual stimulus on which it is based.ÿy´ The experience of Gestalt illusions often appears as volumetric spatial structures bounded by continuous colored surfaces embedded in a volumetric space. These, and many other phenomena, suggest a field theory principle of visual representation and computation in the brain. That is, an essential aspect of neurocomputation involves extended spatial fields of energy interacting in lawful ways across the tissue of the brain, as a spatial computation taking place in a spatial medium. ÿy´The explicitly spatial parallel nature of field theory computation offers a solution to the otherwise intractable inverse optics problem; that is, to reverse the optical projection to the retina, and reconstruct the three-dimensional configuration of objects and surfaces in the world that is most likely to have been the cause of the two-dimensional stimulus. A two-dimensional reverse grassfire algorithm, and a three-dimensional reverse shock scaffold algorithm are presented as examples of parallel spatial algorithms that address the inverse optics problem by essentially constructing every possible spatial interpretation simultaneously in parallel, and then selecting from that infinite set, the subset of patterns that embody the greatest intrinsic symmetry. ÿy´The principle of nonlinear wave phenomenaÿy´ and phase conjugate mirrors is invoked as a possible mechanism. (from the dialog below) ".. IF this is correct - then - our ability to understand observation or perception in psychology is precisely limited by our understanding of phase conjugate physics. A phase conjugate mirror accomplishes self correcting of aberration, time reversal,- in short the observation of self organization. Once we see the holy grail of physics in the fractal Golden Ratio coeur of phase conjugation - we can grok why PERCEPTION IS the WAVE MECHANICS OF PHASE CONJUGATION! This is why I find it so beautifully illuminating that golden ratio in EEG brainwaves - evidently correlates to peak PERCEPTION. Again suggesting strongly that peak PERCEPTION is the perfected PHASE CONJUGATION golden ratio allows. This is infinite constructive wave interference..
How Golden Ratio waves produce more charge distribution (power is area under the curve summed in the next graph ): (proof: the FRACTAL SYNTH software- at goldenmean.info/matrix ). Implications for WHY we see Golden Ratio in Brainwaves during Peak Experience / Peak Perception / Peak Performance - will change Brain Science forever! WHY Golden Ratio - Charge Wave Heterodyning is the Electrical Cause of GRAVITY, LIFE, and CONSCIOUSNESS. - how your vision gets much more clear- when you sit for a moment under an ancient TREE. NOW- we explain WHY to your physics class: The tree's weak charge field (measurement) is more PHASE CONJUGATE (fractal)!! - also Now that we know what creates perception - and the same FRACTAL-FIELD - creates growth thrival - for ALL DNA + the ORIGIN of IMMUNE HEALTH!! - so (knowing the physics of what is a LIVING CAPACITOR / sacred space= fractal charge compression) we now must RE-INVENT ARCHITECTURE - and CITIES!!! Related- Breakthru in Neurofeedback - to MEASURE Phase Conjugation AND Perception?? Once again- Neurofeedback is now radically more powerful: Notice how the Geometric FFT version of the Cepstrum - is now going to allow us to measure not only the amount of INTERNAL PHASE COHERENCE, but will also for the first time dramatically graph the RATIO between harmonics of the EEG geometric cascade - as they move from Octave (left on cepstrum horizontal scale) to Phi/Golden Ratio (right). Thanks to Frank for developing the "GFFT" software to extend my discovery of the CEPSTRUM to measure INTERNAL COHERENCE - now to also measure my other discovery - that the most fundamental factor of all full brain resonant states - is their shift from OCTAVE- storing and isolating the charge content of their array - to Phi/GOLDEN RATIO - where the charge of their array attempts virtually infinite DISTRIBUTION of their array (because PHASE CONJUGATION brings the group of phase velocity interference modes to superluminal infinite propagation). THIS as Douglas White's OBSERVER PHYSICS- and multiple research projects have shown - becomes the very DEFINITION OF TRANSCENDENT CONSCIOUSNESS. 2. That electric fields radiance (the power of life and all survival) is entirely dependant on acheiving fractality. 3. Science discovered genetic diversity = survival / sustainability. When will they discover the electrical PURPOSE of genetic diversity is the accomplishment of the FRACTALITY of field- that makes the bio-field of the genepool self-organizing. (Implosive fractality in the core of DNA-eliminates non-shareable waves, and superluminally connects the sustainable). The reason the need for genetic diversity exists, is to produce the harmonic inclusiveness in the collective genetic bioelectric-field, which MAKES it fractal and therefore sustainable. --It is not that the arrogant biology and health system academics of Earth are worth saving (certainly not the arrogance they represent). But since they are leading billions of children into their deaths- because of their stupidity- we must try to teach the fools. ..do drop me a note to update me - when all the idiot scientists of Earth throw away their curriculum and begin teaching fractality - the electric principle of life. Until then - I stand by my critique - ignore those arrogant + rapidly dying technocrats - and find a fractal environment for your survival. ref: Biologic Architecture. : "The fundamental principle of Lakhovsky's scientific systems may be summed up in the axium 'Every Living Being Emits Radiation'. Inspired by this principle Lakhovsky was able to explain such diverse phenomena as instinct in animals, migration of birds, health, disease, and in general, all the manifestations of organic life. ..According to Lakhovsky, the nucleus of the living cell may be compared to an electrical oscillating circuit.."
"(Life is).. the dynamic equilibrium of all cells, the harmony of multiple radiations which react upon one another (see Golden Ratio creating maximum CONSTRUCTIVE interference- fractal synth). (Disease is).. the oscillatory disequilibrium of cells, originating from external causes. It is, more especially, the struggle between microbic radiation and cellular radiation. ... IF the Microbic (invading unicellular 'infection') radiation is predominant, disease is the result... If cellular radiation gains the ascendant, restoration of health follows" (end quote) - In other words - if the cell is FRACTAL enough to radiate charge more efficiently than it's invaders, then health returns! Lakhovsyy works to create a spark gap or harmonic oscillator whose field effect is harmonic rich enough to heal. This means - that he recognized that the field effect which contained ENOUGH different frequencies - would always heal. This is an excellent prelude to understanding the REAL principle of life - and that is that harmonic inclusiveness perfected - to create life is PRECISELY fractality perfected by Golden Ratio. 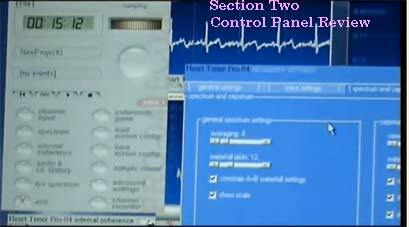 His spark gap, or oscillator circuit to heal - is in essence the same as todays medical heart research. Maximize the NUMBER of contained harmonics ( in the heart - or in anything alive!?) - and you will heal it. Imagine how Lakhovsky oscillator output would show in power spectra, and in IGA fractality in air measure. The Lakhovsky multi wave oscillator which healed many diseases including many types of cancer- is useful for instruction. In the above link (fractalfield) we showed how strong negative ion wind therapy (negative ion: charge fractal black hole...) collapsed many kinds of infection and inflammation. We saw WHY this was not possible if the room is full of (non fractal) metal and plastic. We can extrapolate these insights to Lakovsky. 1. The Secret of Life is the ability to radiate a field. 2. Healing that field and most all disease begins with a field effect which is HARMONICALLY INCLUSIVE. (Amazing that he intuited that about 50 years before today's conclusion in medical literature: harmonic inclusiveness in the heart predicts virtually all disease survival). 1. Life can never radiate a field unless first the field is compressed. 2. Compression and the resultant Radiation of charge is ONLY efficient and therefore sustainable when the charge symmetry is FRACTAL. The real symmetry secret of life is that the field effect which CAUSES life is the efficient charge distribution that results from FRACTALITY. 3. The field frequencies (and phase relation) chosen to grow and heal all biology (DNA) must be a phi fractal harmonic series embedded / in phase with nature - specifically - planck length, hydrogen, and the Sun. 4. Externally triggered fractal fields alone can only sustain biology when biology reciprocates with SELF EMPOWERMENT - learning to then generate that field (gravity) from within. Ion is usefully developing, among other things- the idea that the superluminal (and phase conjugate) charge communion CONE -up and down the DNA helix - is the radio to SOUL..
Thesis of Transcendence - Ion Tudor (exerpt) From The Hypothesis announced before emerges: the Human Soul, triadic encoded, in the DNA and RNA patterns, and more, even out of the body, through DNA Phantom, from the moment of conception of the child and to his death and after death, inter-mediated by The vacuum super fluid, connected with a Consciousness Entity, who acts: organized; systematic. ..... PRINCIPLES - 1.The principle of sonic luminescence conscious pulsations: - The sound can be translated into electro- magnetic radiations and this process is re-versible. Light and Sound together are moving into solitonic - dual wave, which transmits the encoded information of the human genome, like sonic luminescente holograms (Ionel Mohîr - -The Way of the Soul-). 2.Principle of double transcendence or the Holographic (Fractalic) principle: Supposing that relativistic-macroscopic are true, I proved that the macroscopic relations take place even in quantum context and reciprocal, as one might say: what is in the big, it is in the small too, and any part, no matter how smaller is, reflects the entire object-. This proof is unique, based on Ernst equations, Matzner-Misner principle and most important, the transition big-small, small-big was assured by the Barbilian group, invention of a celebrity like this powerful romanian mathematician, Dan Barbilian. Next- a review of recursion / comparing new slip knot model of Electron Geometry - with Flame Letter- Symmetry origins of Alphabet. We compare this to - Origin of alphabets -similar spin path because this alphabet of symmetry is the language of creation? 1st. "waves" vs. "wave-fronts": If we adhere to the idea that all waves (especially also light-waves) are longitudinal phenomena, "nd accept super-luminality as a completely normal property of nature, then the difference between waves and wave-fronts is entirely theoretical. b) a primarily transcendentally (super-luminally) expressing part. 3rd. "observer": The "global" separation of super- vs. sub-luminality is in reality a contained or "local" phenomenon. * Philosophy never tackled the problem of individuality in a gentle way, instead in many cases brutally assaulted and abused it, causing a tremendous lot of confusion, superstition and suffering..
* Einstein essentially says: that which moves slower than light can never move faster than light..
* ALL quantum interpretations say: we don't understand the physics of interpretation. hold your work in high esteem - as you can see by our quoting you frequenty..
Perhaps in many ways - your thoughtful model - leads to / agrees with ? this hypothesis I have formed that PHASE CONJUGATION is the essential wave mechanic principle of perception? If I understand you have also hypothesized that phase conjugation may be a bonding mechanism inside the nucleus? What happens in optics phase conjugate mirror (where we believe the non-linear mirror material provides a self similar or fractal path for optical charge waves).. In the 'grail' center of phase conjugation (animated - goldenmean.info/grail) is the only place an infinite number of both wave lengths and wave velocities (phase or group waves) - can meet. Hence - it becomes self evident this (fractal charge compression symmetry) would be the wave mechanic perception / obervation. Simplifying - we have both the new physics and philosophy that implosive / fractal / phase conjugate charge compression environment defines: perception/ observation, mass creation / and gravity created from charge. Clearly this is related to the access to superlumninal charge propagation efficiency you yourself describe as the mechanism of phase locking into the inPHIknit.. you have described as cosmic consciousness. (quote from Douglass White) "The slower a massive object moves, the faster its phase velocity becomes. If the object comes to rest, its phase velocity encompasses the universe in a flash. An observer generally has attention on a relatively motionless environment around him. The phase velocity thus generates the impression that the observer and his local environment is embedded in a virtually infinite universe. This is the motivation for meditation. If you bring your attention on the physical world into a state of deep rest and silence, the phase velocity of your attention instantly spans the universe." From frank@heartcoherence.com - "The central issue is how these subtle phase-waves not only manage to survive in the turbulent and unpredictable thermodynamic ocean, but actually start controlling material processes from a cosmic ("super-luminal") vantage point. This phenomenon of phase-waves literally getting in charge results in nothing less than the advent of life in the universe, on all scales - atomic, biological and cosmic. This is what makes the cosmos a place of meaning, purpose and beauty. 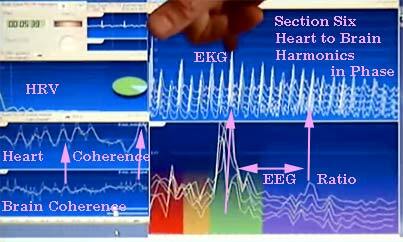 The physics principle of subtle phase-waves taking control is called "heterodyne phase-conjugation" and especially in relation to bio-physiology it is usually called "coherence". Breakthru - in environmental design: (self organization of phase conjugate electric field fractality).. IF this is correct - then - our ability to understand observation or perception in psychology is precisely limited by our understanding of phase conjugate physics. This is why I find it so beautifull illuminating that golden ratio in EEG brainwaves - evidently correlates to peak PERCEPTION. Again suggesting strongly that peak PERCEPTION is the perfected PHASE CONJUGATION golden ratio allows. (infinite constructive wave interference..). Would this not simplify into the requirement that the observers charge or wave system (foci) cannot interact and observe unless the waves get PHASE CONJUGATE or fractal with respect to the waves (inertia) being observed. This then is WHY golden ratio is necessary to set up the phase conjugate relationship (place where maximum exchange in info / inertia is possible). This requirement then being what sets up the need for self-similarity and scale invariance - all optimized by Golden Ratio and its cousins. Applied to gravity - our research group and preliminary experiment design goldenmean.info/gravitycause is dedicated to proving experimentally that the CAUSE of gravity from charge is precisely the compression that turns in to acceleration of charge which phase conjugation / self similar / fractality allows. We articulate two potential revolutions in neurofeedback: 1. 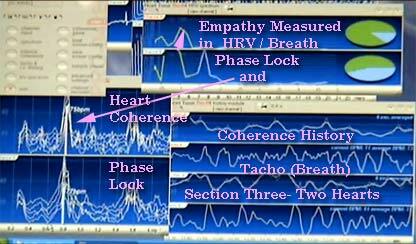 COHERENCE measure for EEG based on new CEPSTRUM (double FFT), 2. 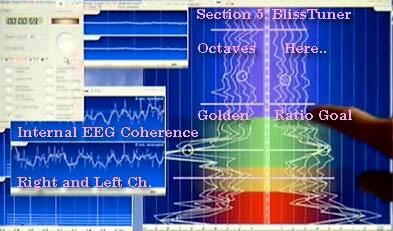 Golden Ratio vs Octaves in EEG optimized "BlissTuner" Neurofeedback. We review -4 precedents in the literature: Golden Ratio in EEG correlated to Peak Experience / Peak Perception / Peak Performance. 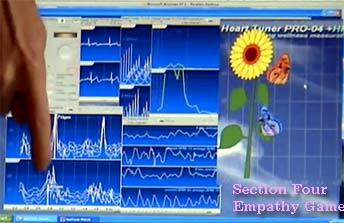 We developed BlissTuner tool to offer golden ratio EEG training. Examples / Animations presented. We developed Fractal Synth software - to prove why golden ratio (charge) wave forms produce maximum constructive interference. This supports hypothesis that fractal and non-destructive charge compression is a primary mechanism of consciousness. Related evidence presented : fractal non-destructive charge compression as electric cause of gravity, and mass creation. All 4 of the geometric animations he uses on his home page - to teach "Phi Recursion physics" , are ones Dan Winter created..from his simple equation FOR PERFECTED phase conjugation. He used the Golden Mean spiral mapped into 3D either on the (60 degree) Cone of concentric Dodec, and also that same Golden Spiral - topo mapped on the torus shape of all fields (origin of alphabets). the first one to explain, but anyway the closer look brought up some interesting details..
on the PHYSICS criteria of scale-invariability and heterodyne phase-conjugation. because of that a direct receipe for fractality (see e.g. Fractal Synth numerical clue). around. I'm affraid that Nassim would smile here. > I love your gorgeous animated graphics. > with some new updates. I wish I had the computer skills you all have. Update- Mar 13: -Subject: fractal time vs the observer Paper from- Fractal Research Institute,[Fwd: Re: proving fractality electrically causes gravity], From: Dan Winter <danwinter@goldenmean.info> To: douglas white <dpedtech@dpedtech.com>, -scientists list..
that would depend on [charge] compression (in space and time..
She is presenting- The Kairos Syndrome - at the Chaos conference, - http://www.ulg.ac.be/mathgen/CHAOS/CASYS.html , Liege belgium coming up ( many of the papers at that conference, are from members of our budapest conference) Sal, Richard Amoroso, ..Isvan Dienes..
Hello Dan, -- Yes, if Daniel is agreeable, I shall be presenting a paper in Liège again, this time on "The Kairos Syndrome". - - I looked at what you sent me, ... it's a lot and I haven't read it all. "Fractal Time, Observer Perspectives and Levels of Description in Nature"
(a fractal one, of course, the nestings being generated by contextualization).